Robots consistently help humans in dangerous and complex tasks by providing information about, and executing tasks in disaster areas that are highly unstructured, uncertain, possibly hostile, and sometimes not reachable to humans directly. Prototyping autonomous multi-robot systems in disaster scenarios both as hardware platforms and software can provide foundational infrastructure in comparing performance of different methodologies developed for search, rescue, monitoring and reconnaissance. 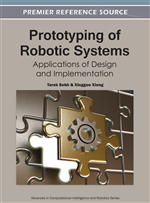 In this chapter, the authors discuss prototyping modules of heterogeneous multi-robot networks and their design characteristics for two different scenarios, namely Search and Rescue in unstructured complex environments, and connectivity maintenance in Sycophant Wireless Sensor Networks which are static ecto-parasitic clandestine sensor networks mounted incognito on mobile agents using only the agent’s mobility without intervention, and are cooperating with sparse mobile robot sensor networks. Natural or manmade disasters yield catastrophe areas with many different characteristics such as variability of disaster from earthquakes, fires or terrorist attacks. Among these various characteristics, a common characteristic is that all disaster areas are highly complex, uncertain, vast in comparison to shortness of exploration time, completely unknown, and hardly measurable for search and reconnaissance tasks. During search and rescue among rubble of a disaster area, the location of buried victims must be determined as quickly as possible and the environmental conditions for reaching victims must be determined as completely as possible so that rescuers can enter the disaster area to reach and save the life of survivors. Search and rescue teams made of living beings have the important disadvantage of physical limits such as in efforts leading to exhaustion. Moreover catastrophe areas are generally hostile to humans, bearing the risk of local collapse due to unstable structures. Hence, fast and efficient search is critical for rescuing victims from their possible trapped position within the debris. In the last decade, technological developments on robotic hardware, software, control and communication abilities caused an increase in the use of autonomous robots in search and rescue operations, although they remain still highly inefficient in real world applications. To increase the performance of the robots in the sense of time, energy and task accomplishment, a huge number of researchers have focused on the development of efficient multi-robot search and rescue systems rather than single robot ones. Because, disaster environments are generally highly complex, uncertain and unstructured, heterogeneous robot teams which consist of multiple robots with different capabilities, equipped with various sensors, actuators, computational abilities and control algorithms ranging from classical to intelligent and even bio-inspired, increase the mobility of the rescue team within debris. Hence, probability of recovering victims from rubble in a safer manner is increasing and possibility of injury during rescue is decreasing. For search and rescue in disaster environments using heterogeneous robot networks, global tasks have to be divided into small ones and subtasks should be assigned to each robot according to robots’ capabilities in order to increase the efficiency in the sense of time and energy. Snake like robots for example can infiltrate among the most hectic rubble, while heavy stones and obstacles can be pulled aside by powerful robots equipped with proper end effectors. Besides, mobile robots with different sensors can generate map of debris in order to compile the inventory of the disaster and detect passages for other mobile robots to navigate further for victim search rescue and/or monitoring. On the other hand, a robot team as a whole has to be capable of decentralized decision making. In centralized control approaches, each robot unit sends collected information from the environment to the leader to carry out decision making. The one robot that works as a leader, makes all navigation plans to accomplish a given task based on data collected from each robot unit. Centralized approaches are not realistic for search and rescue operations especially because of communication burden, because all information obtained from the disaster environment has to be transmitted to the leader robot and final control decisions have to be sent back to each robot for individual execution. And also it makes response of the system very slow and inaccurate. However, decentralized heterogeneous search and rescue teams are systems least affected by communication failure or imperfect communication and computational approximation errors; and also are more robust against failure of one of the team members which can occur frequently while operating in harsh catastrophe environments. During a search and rescue operation, communication maintenance between robot units is crucial to prevent robots from getting trapped or to convey information about the internal structure of the disaster environment and relay survivor data to a base station. Hence, connectivity maintenance algorithms have to be developed for multi robot teams. However some challenging problems still remain unresolved because of the following source of uncertainties. Some of them are about limited and noisy sensor measurements, unpredictable environment conditions, mechanical failures and some uncertainties caused by algorithmic approximations. These limitations make search and rescue operation difficult using multi-robot systems. Above, we mentioned open questions and challenges in the field of search and rescue using multi robots some of which are Simultaneously Localization and Mapping (SLAM), and goal oriented exploration. Physical constructions of robot team members as well as Sycophant Wireless Sensor Networks are also mentioned as requirements for hardware prototyping in this research field. Hence, we will focus on those topics as the main modules of the chapter in order to provide a spectrum of multiple prototypical tools and concept gathered from many sources in the literature that will yield rapid and efficient multi-robot systems for search and rescue.